Gold Concentrator | Gold Processing Equipment | Star Trace Pvt. Ltd.
STAR TRACE concentrator is kind centrifugal concentration equipment .It can be used not only for placer gold mining, but also for hard rock mining to recover the natural gold, replacing amalgamation. It is also used to recover gold from the old tailings. Since1985, three models have been developed. Application shows that the recovery can be as high as 99%, especially for the case in recovering the natural gold in lode ore with 65% of the ore having milling size of 0.074mm,the recovery for the natural gold is expected up to 98%. For that natural gold of 0.004mm in particle size. The recovery is 97%. The cleaning up cycle is 1~4 hours. And the upgrade ratio is up to 1,000 times. The STAR TRACE Concentrator is specifically designed for recovery of free, metallic gold, platinum or silver from hard rock circuits and is also an ideal technology for alluvial gold including secondary. Recovery from sand and gravel operations. The STAR TRACE Concentrator subjects the material Being processed to a centrifugal field of up to 60G ’s which allows recovery of finer native metals than with conventional gravity concentration equipment. Periodically, the high grade concentrate is removed from the concentrate cone during the rinse cycle. The rinse cycle time is typically less than 20 minutes per cycle. Optimum operating cycles will range from 1hr to 4hrs. Feed is screened at approximately 2-4mm depending on the application, introduced as slurry through the central vertical feed pipe and accelerated by the rotor. Rapid stratification according to specific gravity occurs as the material is driven up the grid concentrate cone wall under the influence of an immense gravity field. 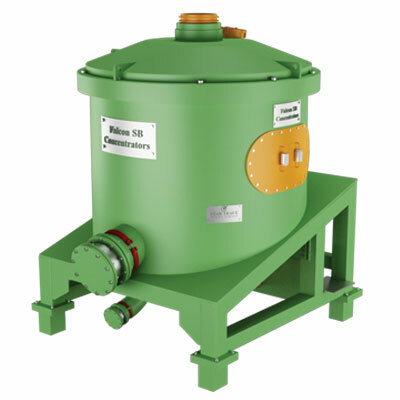 Fluidization water is injected through the rotor wall to create a dilated or fluidized bed. The high specific gravity gold or other target particles become embedded in this zone and are retained here until the machine is stopped and the concentrate is rinsed down through the concentrate discharge ports. A centrally located rinse manifold directs jets of water to thoroughly rinse concentrate from the retention zone after each operating cycle. The preparation and pre-check before startup. Prepare and check before startup according to the operating requirement. Check whether the degree of tightness of V belts is appropriate. Check whether the moving part is no intervening to each other. Check whether the Concentrated is charge pipe is closed. Follow the requirement of the preparation and pre-check before startup, then, turn on the power supply. Make sure the running orientation of Electro Motor is the same as red arrow head on the outside of launder and every part does not interfere each other. All after that, you can turn on the power supply and the equipment is under the natural running. Feed the slurry Open the fluidization water valve when the equipment working normally, mean while, feed the slurry which confected under the required proportion of liquid and solid. Under the working requirement of electromotor, watch the temperature and current. Make sure that every moving parts are working normally. Pay attention to the proportion of liquid and solid of slurry at any time, adjust it in time. Clear up the concentrate after the period of working time. Before stop the equipment, stop feed slurry first and then stop supplying fluidization water, stop the equipment at last. 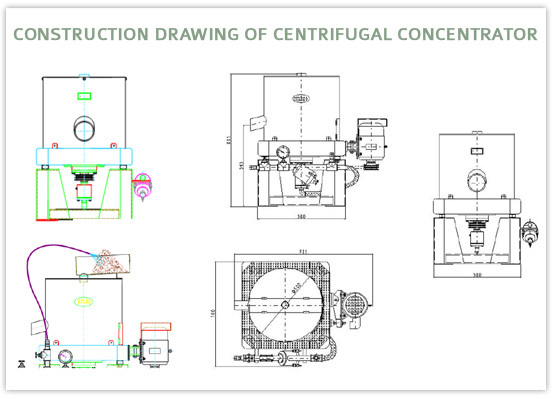 Stop the equipment for a long time is lose, because it is easy to the concentrate which is in the concentrate cone. In addition, it must feed slurry at first then add the fluidization water when turns on the equipment again after temporarily stop the equipment. It can avoid losing gold. Maintenance the equipment periodically as the requirement to electromotor. Clear up the equipment after one period of working time. Special OBMS can be made on request, Please send us your technical data and application, required for our engineers to provide.